34 www.coalage.com May 2018 diesel engines Can Diesels Meet the Challenges of Alternative Power Technologies? Engine builders believe big diesels will be a vital part of off-road power solutions for the foreseeable future, but they're not ignoring the appeal of battery-electric and hybrid options by russell a. carter, contributing editor In the realm of surface mining, diesel pow- er rules the road — regardless of whether the road is a carefully engineered route for haulers or a pit-bottom path for load- ers. Inside and outside the pit, mine utility equipment is generally diesel-powered as well, and off-grid mine sites often depend on diesel-powered generation sources for at least part of their electrical needs. In other words, when it comes to mov- ing payloads, equipment — and in some cases, electrons — diesels are the 800-lb gorilla that sits near the top of the food chain. The problem is that the gorilla's hy- drocarbon diet is expensive, prone to con- tamination that wears out engine parts and causes unscheduled downtime, and comes with a lengthy list of adverse environmen- tal impacts. It's the main reason why mine operators have an ongoing love-hate rela- tionship with diesel power — loving the op- erational familiarity and the flexibility that only self-powered haul trucks on the sur- face and cable-free vehicles underground can offer, but hating the expense, high con- sumables rate and exhaust emissions that are inherent with diesel-fleet operations. In recent years, that relationship has been strained even further by the appeal of options such as in-pit crushing and conveyor transport that drastically reduce the haul truck's role in production. Under- ground, diesel's hard-rock mining role is being challenged by the expanding avail- ability of all-electric and battery-powered production units that put less of a strain on a mine's ventilation requirements and elim- inate most of the noise, logistics and heat problems associated with diesel operations. 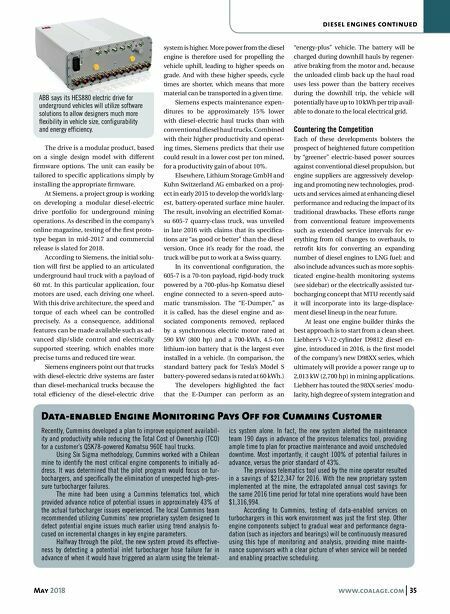 Although diesel still holds the winning hand in fuel efficiency — a gallon of die - sel fuel has 20 times the energy density of equivalent lithium ion or molten-salt batteries — the leading diesel engine sup- pliers for mining applications have taken steps to establish their presence in the bat- tery-electric market. In October 2017, for example, Cummins announced it was ac- quiring Oregon, USA-based Brammo, Inc., which designs and develops battery packs for mobile and stationary applications. Adding Brammo's battery pack expertise and resources, according to the compa- ny, is important to its efforts to become a global electrified power leader. Caterpillar is hedging its bets on diesel versus electric in several sectors. It has in- vested in metal-air battery developer Flu- idic Energy and formed a strategic alliance with solar panel provider First Solar as part of its strategy to offer "hybrid" pow- er microgrids that use thin-film solar, ad- vanced monitoring and control systems, and energy storage devices such as ultra- capacitors and advanced batteries along with its diesel and natural gas-powered generators to provide electricity at remote sites. In the mobile equipment sector, its Underground Mining group developed a prototype battery-electric R1300G LHD for testing at a mine site in Canada. The machine is a proof of concept for packag- ing and performance of a lithium-based energy storage solution Caterpillar plans to bring to the LHD market. Sandvik, having developed its LH307B battery-powered LHD and hybrid DD422iE underground drill rig, is working with Gold- corp to convert that producer's Borden Lake mine in Ontario, Canada, to fully electric underground operations. And in October 2017, Atlas Copco announced its intention to focus on zero-emission and battery-driv- en machinery. The company said it has im- mediate plans to expand its current portfo- lio of electric mining equipment, including loaders, drill rigs and mine trucks. Artisan Vehicle Systems, a California, USA-based company, now offers the A4, a battery-powered 1.5 yd 3 , 4-mt LHD. The company claims a number of advantages for the A4 over conventional diesel-pow- ered LHDs, including the ability to design a much shorter machine that provides a dis- tinct improvement in both maneuverability as well as front and rear visibility compared with diesel-powered loaders that may be as much as a meter longer front to back. The potential for overall size reduction and other benefits of electric underground vehicles is apparent to industrial technol- ogy giant ABB, which has developed the purpose-built HES880 mobile drive for this type of application. This is a totally different design from anything available previously, according to the company, al- though it is based on ABB's well-known ACS880 all-compatible drive technology. 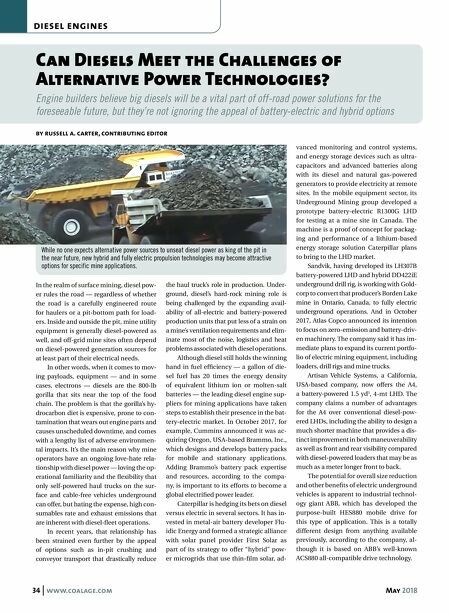 While no one expects alternative power sources to unseat diesel power as king of the pit in the near future, new hybrid and fully electric propulsion technologies may become attractive options for specific mine applications.